In 2007, the Island & Village of Geneva Rural Heritage Center, Inc. was formed as a 501(c)(3) organization to help celebrate the rural heritage of Eastern Seminole County. In 2009, the Seminole County School Board generously offered to donate the historic Geneva School House to be the home of the Rural Heritage Center. The Center partnered with neighboring rural communities of Black Hammock and Chuluota to create a community learning center to provide hands-on learning to the Central Florida community. Since then, the Geneva School House is ushering in a “Rural Renaissance” for Central Florida. At 101 E. Main Street in Geneva, the historic brick school house is now the home of the Rural Heritage Center, celebrating the rural traditions of the past, present and future of Seminole County, Central Florida and beyond. 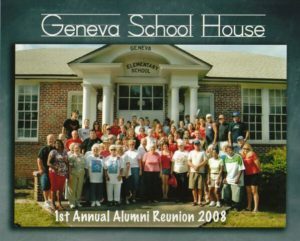 There are 64 years of Alumni from the historic Geneva school house with whom we are trying to connect. Each fourth of July, we hold an annual reunion and photo opportunity so former classmates can fellowship and reminisce. If you were a student, teacher, staff or parent at the historic Geneva school house, please join our Alumni group. The school is slowly being renovated – new hardwood floors, carpeting, painting, decorating, roof repairs, and other improvements. Almost all of the work has been performed by volunteers from the local rural communities. New landscaping is being installed and “Founder’s Square” around the new flag pole has engraved bricks that members have donated to help support the Center. The Founding Officers of the Rural Heritage Center were: President – Christopher Stapleton, Vice President – Carl Anglesea, Secretary – Mary Jo Martin, Treasurer – Bonnie McFarland. The Founding Board Members were: Imogene Yarborough, Bob Hughes, Deborah Schafer, Robert King, and Dr. Tina Irwin. Our Rural Heritage Center is a new endeavor with much of the work completed and much more to do. Please join your East Seminole neighbors and support your new Cultural Center.